New York : Back Bay Books, 2009.
xv, 332, 16 p. ; 21 cm. Martha Carrier was one of the first women to be accused, tried and hanged as a witch in Salem, Massachusetts. Like her mother, young Sarah Carrier is bright and willful, openly challenging the small, brutal world in which they live. Often at odds with one another, mother and daughter are forced to stand together against the escalating hysteria of the trials and the superstitious tyranny that led to the torture and imprisonment of more than 200 people accused of witchcraft. This is the story of Martha&apos;s courageous defiance and ultimate death, as told by the daughter who survived. 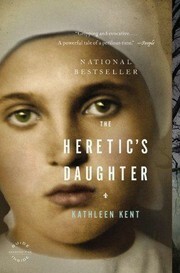 The heretic&apos;s daughter : a novel / Kathleen Kent. Back Bay trade pbk. ed. $c Statement of responsibility Kathleen Kent. 250 Edition $a Edition statement Back Bay trade pbk. ed. 500 General Note $a General note Includes reading group guide. 520 Summary $a Summary, etc. note Martha Carrier was one of the first women to be accused, tried and hanged as a witch in Salem, Massachusetts. Like her mother, young Sarah Carrier is bright and willful, openly challenging the small, brutal world in which they live. Often at odds with one another, mother and daughter are forced to stand together against the escalating hysteria of the trials and the superstitious tyranny that led to the torture and imprisonment of more than 200 people accused of witchcraft. This is the story of Martha&apos;s courageous defiance and ultimate death, as told by the daughter who survived. $d Title point value 17.